I usually think of a rat rod as a car with a lot of patina and a lot of power, so I hesitated a moment when I saw the shine on this chopped top, channeled 1930 Model A Rat Rod – but – it’s edgy enough to fall in the rat rod category and it definitely brings the power with its 350 cubic inch Chevy engine, and its 350 turbo transmission. Looking to Buy a 1930 Model A Rat Rod? I want to start by mentioning that this rat rod is listed for sale on eBay, and you can tell at a glance it’s going to be a head-turner and totally fun driver for whoever picks it up. This car already has a lot going for it, and it also has some things that need some work, and the seller details those with a great deal of honesty and even made sure to show the places that need work in his photos, so there’s no guessing or wondering what you need to take care of with this ride. 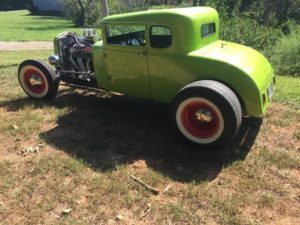 While this chopped and channeled ’30 Ford Model A is a great rat rod, it also wouldn’t take a lot to fix up the rough spots and transition it into a classic street rod. For example, the seats don’t match anything but the red rims on the car, and they aren’t fastened in because they’re too tall for the car. I was looking on specs for the original height of the 1930 Model A and didn’t find anything, but I did find that there were three million Model A’s built and they came in nine different body styles. Production of the Ford Model A ended in 1932 with a total of 4,858,644 Models A’s produced from October of 1927 (1928 models) through the end of the A line production. Classic Cars Online US is proud to partner with eBay to bring you this information on the 193o Ford Model A Rat Rod by showing you the ’30 Ford A Model rat rod for sale in the photo.